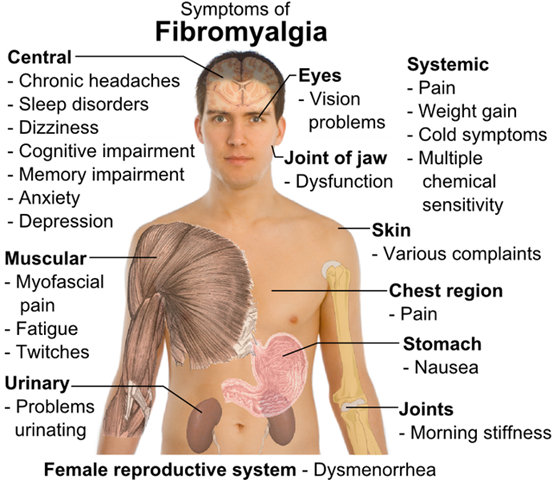 What is Fibromyalgia, symptoms and Cure? 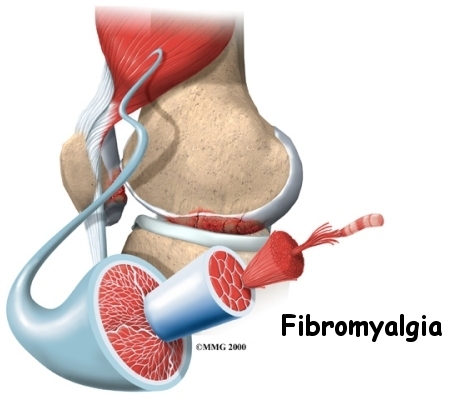 After osteoarthritis, Fibromyalgia is the common musculoskeletal condition. Widespread muscle and joint pain and fatigue are some symptoms of this disease. This disease is often misdiagnosed and misunderstood by the people. Here I have got all the important information about this disease. Anxiety or depression, Decreased pain threshold or tender points, Incapacitating fatigue, Widespread pain, are the common symptoms which occurs together in case of fibromyalgia syndrome. This disease is more common in women than in men. Almost 12 million people are suffering with this disease in America. You will get pain all over your body. Sometimes you will feel pain on some specific tender points even on touching. In some cases the muscles of the patient twitch, burn, or have deep stabbing pain. Apart from this some patients got pain around the joints of neck, shoulder, back, and hips. 5). Dryness in nose, mouth and eyes. 7). Tingling or numbness in the feet and fingers. 8). Hypersensitivity to cold or heat. These are the major symptoms of this disease. If you notice these symptoms in you or in some one else in your family, then immediately concern your doctor. What are the treatment methods of Fibromyalgia? There is no cure of Fibromyalgia. This disease can’t be cured permanently but have some alternative treatments like medication and exercise. American College of Rheumatology has said that “medicine only treats the symptoms of this disease”. Lyrica, Cymbalta, and Savella are the three medicine approved by FDA for the treatment of Fibromyalgia. Antidepressant such as Prozac, Paxil, or Zoloft will help you to get relieve from depression, sleep disorders, and pain. Through a research on the medicines of this disease, Scientists have found that antiepileptic Neurontin is best for the treatment of Fibromyalgia. The nonsteroidal anti-inflammatory drugs (NSAIDs), including Cox-2 inhibitors are most promising for the treatment of FMS pain. There is no medicine invented yet for the permanent treatment of Fibromyalgia but the patients will get relieve to some extend with the intake of these above written medicines. Researchers have found these medicines most promising than any other medicines available in the market. Most of the doctors prescribe these medicines for the temporary treatment of Fibromyalgia. Nice share about fibromyalgia. I know what can it do on human body. Because my cousin suffered this problem from few years but now she is ok. I got huge information from your article. Thanks a lot.